Huh? Clutch Cargo is an animated television series noted for its very limited animation, yet imaginative stories. The series was a surprise hit, and could be seen on 65 stations nationwide in 1960. Because of budgetary limitations and the pressure to create television animation within a tight time frame, the show was the first to use the "Syncro-Vox" optical printing system. 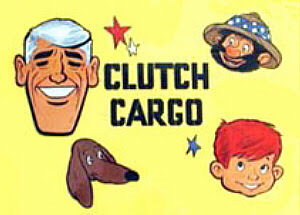 Clutch Cargo employed the Syncro-Vox technique by superimposing live-action human lips over limited-motion animation or even motionless animation cels. There were 52 Clutch Cargo adventures which are now available on DVD. Find out more about Clutch Cargo at Toon Tracker. Clockwise from top left: Clutch, Swampy, Spinner, and Paddlefoot. Enjoy Paddlefoot and his pals in "Jungle Train."